180 Series, 140 Series, and 380 Series Right Angle Flow Control, Needle, and Check Valves by Watson Pneumatics provide reliable performance at all pressure levels and flow rates. You get 2 psi break-away with generous reverse flow volume, and bubble tight sealing with precise adjustability for the controlled side. 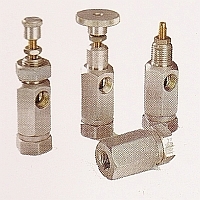 Check valves are also bubble tight and open at 2 psi in reverse flow. Body and cap are aluminum with orfice and needle made from brass.